After a recent tip on how to extract two mono tracks from a stereo track, one of the comments asked for how to convert mono into stereo. Well, we aim to please…so here’s one option. A common way to create stereo from mono is by duplicating the track, delaying one of the tracks compared to the other, and panning them left and right. However, this approach has two problems. First, you might not want a delay. Second, when you collapse the signal back to mono, there will likely be partial cancellation due to phase differences. The method we’ll cover here not only produces stereo imaging from a mono source, but collapses perfectly to mono. It works with pretty much any instrument, but is most effective with instruments that play chords (for example, try this on acoustic guitar—it works well). Create two buses. One of these will become the left channel, and the other, the right channel. In your mono source track, create two pre-fader sends (one for each bus). Turn down the mono source’s fader. 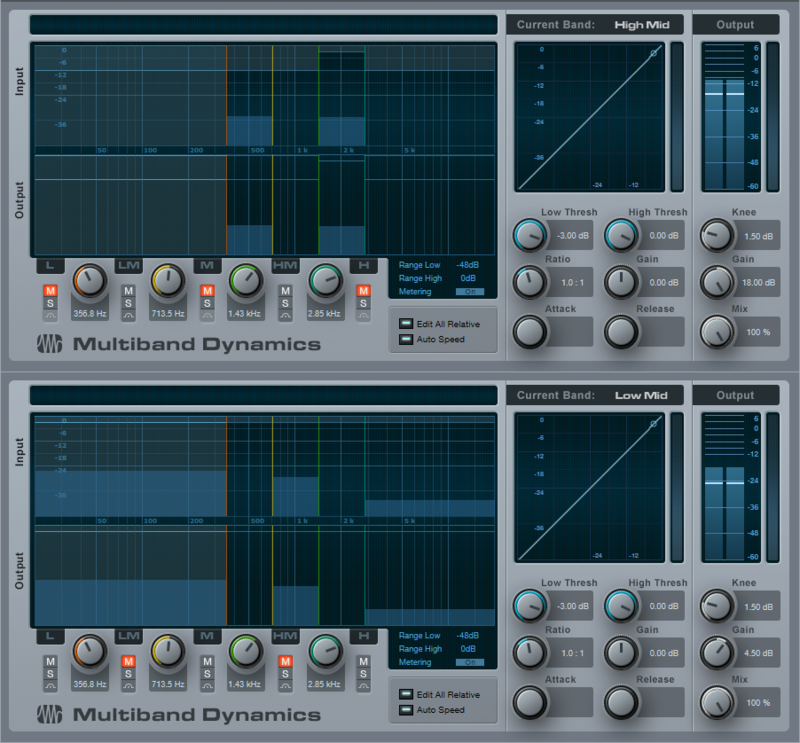 Insert a Multiband Dynamics into one of the bus inserts. Solo the bus with the Multiband Dynamics. Click on “Edit All Relative” and set the Ratio control to 1.0. This will set all bands to a ratio of 1.0, which converts the Multiband Compressor into a multiband EQ. Play the track you want to convert to stereo. Solo each band in the Multiband Compressor, and adjust the frequency sliders to divide up the frequency response evenly over the five bands (the screen shot shows frequencies selected for dry electric guitar). Mute bands 1, 3, and 5. We’re not done yet, though. The levels of the two buses will be fairly low because with only two or three bands, the output level will be down quite a bit. Turning up the bus faders may be sufficient to compensate, but if not, turn up the Multiband Dynamics processors’ master Gain controls (not the per-band Gain controls). Feel free to play around with the pan and Gain controls to achieve the desired sonic balance. Also, no law says you need to mute every other band. For example, you might want a bassier sound on the left by muting the three upper bands, and a brighter sound toward the right by muting the two lower bands. Finally, note that when you toggle the master bus from stereo to mono, the sound collapses to mono without any funky phase interactions. Done! I don’t double parts much, I think individual parts generally have more focus. Of course there are situations were layered sounds work, but for those, you don’t need artificial stereo. Cool, that’s exactly the point – no phase issues. 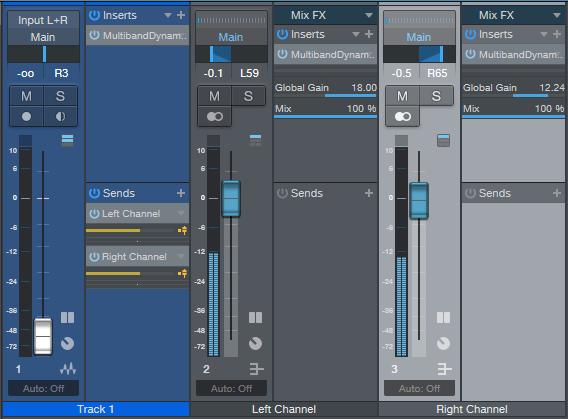 If you have Studio One Pro, the suggestion below about using FX Chains makes sense if you have a “favorite” setup. I often find, though, that I need to make changes for different signal sources, and it can be more convenient to expose everything through buses. I can tweak one EQ, drag it over into the other insert, and do the complementary gain thing easily. The splitter can split the channels into left and right, different frequency bands, or parallel signals. I don’t know about the macros… Maybe someone else can shed some more light regarding that! Why not record two guitars? This works really well! The phase cancellation thing is all but eliminated with this over a low ms delay doubling technique. I built this into my templates! Thanks! First, thanks for commenting, feedback is useful 🙂 Yes, it could definitely be done in the channel splitter, but…although I don’t have Studio One Artist, I believe it doesn’t do parallel effects (someone can correct me if I’m wrong), nor does it have macros. Last week’s tip and next week’s both use parallel effects chains and macros, so I wanted to do something more universal. Frequency splits would be useful for something different, the parallel effects crossover splits are high and low, and you need bands to be able to collapse into mono without issues (which was a major motivation for this tip). However, what you’re suggesting could have other applications other than just converting mono into “faux” stereo. As you may know I’m super into multi-band processing, so I definitely know the value of what SO4 offers with parallel effects! The frequency crossover can do virtual stereo somewhat like the virtual mics techniques I’ve written about. Thanks for that tip. May try it soon. But I guess this could also be done with a channel splitter in the FX routing window instead of using extra buses. Because even if the events of a track are mono you can switch between mono and stereo processing. Also worth a try: Instead of splitting the signal into left/right you may create a couple of splits by frequency and putting a dual pan fx into every split. By that you are not limited to the number of bands the multiband dynamics fx offers AND you could also pan every frequency range wherever you want. Because that is what you basically do here, if I am not mistaken.